NASA’s OSIRIS-REx spacecraft executed its second Asteroid Approach Maneuver (AAM-2) yesterday. The spacecraft’s main engine thrusters fired in a braking maneuver designed to slow the spacecraft’s speed relative to Bennu from 315 mph (141 m/sec) to 11.8 mph (5.2 m/sec). Likewise, the spacecraft’s approach speed dropped from nearly 7,580 miles (12,200 km) to 280 miles (450 km) per day. The mission team will continue to examine telemetry and tracking data and will have more information over the next week. This burn marked the last planned use of the spacecraft’s main engines prior to OSIRIS-REx’s departure from Bennu in March 2021. The OSIRIS-REx spacecraft is in the midst of a six-week series of maneuvers designed to fly the spacecraft through a precise corridor toward Bennu. AAM-1, which executed on October 1, slowed the spacecraft by 785.831 mph (351.298 m/sec) and consumed 532.4 pounds (241.5 kilograms) of fuel. AAM-3 is scheduled for October 29. These high-precision changes in velocity, speed and direction will be critical to spacecraft operations near Bennu. Because Bennu is so small, it has a weak gravity field. These changes allow the spacecraft to slow down and to do the maneuvers that are planned to explore and map the asteroid. The last of the burns, AAM-4, is scheduled for November 12 and will adjust the spacecraft’s trajectory to arrive at a position 12 miles (20 km) from Bennu on December 3. 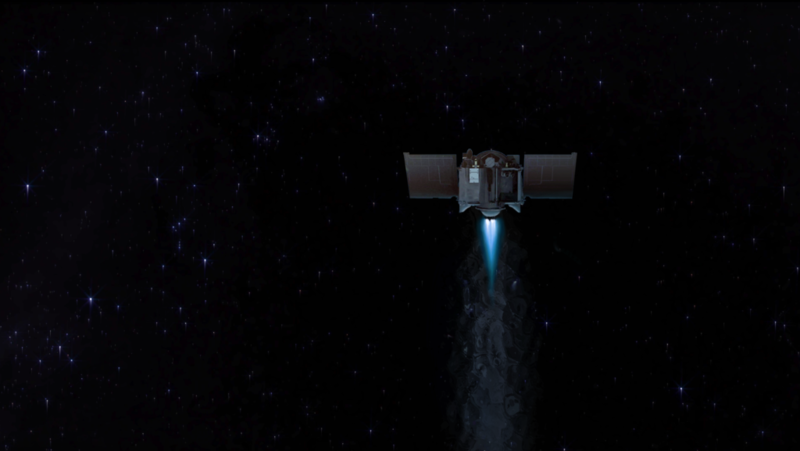 After arrival, the spacecraft will perform a series of fly-bys over Bennu’s poles and equator. Once the OSIRIS-REx spacecraft maps and explores Bennu, it will retrieve a sample of the asteroid to return to Earth. This sample of a primitive asteroid will help scientists understand the formation of our solar system more than 4.5 billion years ago. NASA’s Goddard Space Flight Center provides overall mission management, systems engineering and the safety and mission assurance for OSIRIS-REx. Dante Lauretta of the University of Arizona, Tucson, is the principal investigator, and the University of Arizona also leads the science team and the mission’s science observation planning and data processing. Lockheed Martin Space Systems built the spacecraft in Littleton, Colorado, and is providing flight operations. Goddard and KinetX Aerospace are responsible for navigating the OSIRIS-REx spacecraft.